Kim took some really great pictures on Christmas day. Here's a sample. 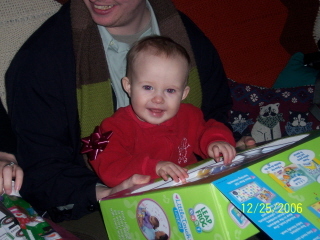 Lorelai loved the bows. We kept sticking them all over her all day. I took these pictures on Thursday. 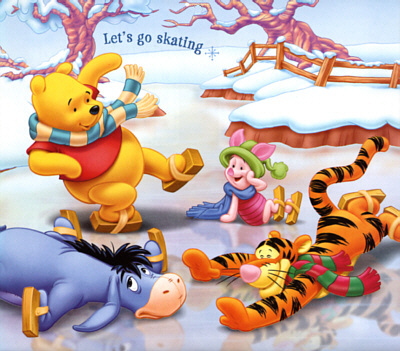 I think Pooh would need more than that scarf out there today. It's finally really cold. I think it was 11 degrees when I got up this morning. I went out last night and wore those thick cable knit socks I made. My feet were toasty warm. I'm glad I still have more of that yarn. It makes great socks. I love reading blogs. I'm a fan of several, particularly those written by Stephanie Pearl-McPhee (aka The Yarn Harlot), actor Wil Wheaton, and a delightful site by the equally delightful Meg Wood called The Boyfriend of the Week. These three are well-written and entertaining and I read them frequently. 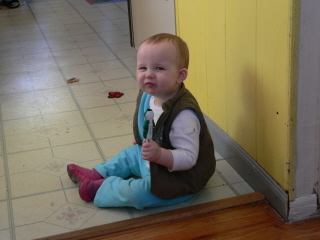 Stephanie's blog, in particular, just amazes me. She has a huge readership/fanbase. The comments on her posts often number in the 200's. Although I don't know a thing about poker and I'm only a lower class geek, Wil's posts about his family are witty, charming and touching. Meg Wood's sense of humor is strangely familiar to me! She so reminds me of Kelly sometimes. The writing is so similar. She's also a librarian who appears to be a voracious reader. How can you go wrong? Where is the rant, you ask? I also read lots of other blogs and blog-type postings around the web, particularly on myspace. I'm beginning to notice such an appalling lack of proper spelling and English grammar that it just frightens me. Are students not learning spelling and grammar anymore? Are the basics pushed aside while we rush to get students through the next standardized test? I don't know. In my interpreting career, I've haven't interpreted many English/Language Arts classes so I can't speak for the curriculum these days. The frightening thing is, this isn't new. I've noticed poor grammar skills in newscasters for years. Don't these people have editors who will correct them when their grammar is a bit off? I wonder sometimes if this is just so noticeable now because of the instant access to the internet. Still, why is it that young people seem to be computer geniuses and can't spell to save their lives? I've seen web pages that show an amazing skill along with amazingly bad spelling. Use spell check, people! That's why the computer gods gave us spell check! Sigh. Along with painful spelling and grammar, the anonymity of the web also leads to some incredibly nasty comments, some so hurtful, they make me gasp. Is that necessary? The fact that no one actually knows who's posting this stuff seems to give some people license to say whatever they please, no matter how vile. It's a scary trend. I'm glad my kids aren't teenagers anymore. That's all I can say. She's just the cutest thing. Here's a hat I made for Billy recently. It's closer to a denim blue. I used the Knitware program to make it. You take 2 measurements, the circumference of the head and the measurement from ear to ear and enter those into the "hat calculator" part of the program. 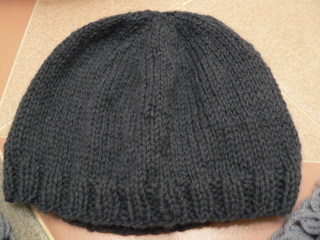 It calculates a hat pattern based on the measurements entered. It's so easy. I just finished this shawl a couple of days ago and it has been blocking since then. Towards the end of the border pattern, I was getting really impatient. I had five rounds to go and told Kelly I was about done with it five round ago! But, I knew I'd love it when it was done and I do. 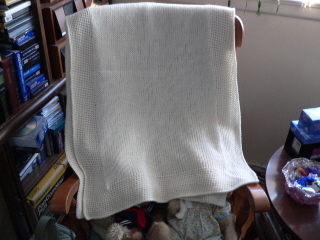 It's Paton's classic wool in the winter white color, very soft and warm now that it's blocked and beautiful. Bill helped me find out how to convert the quicktime video I have of Lorelai so I could put it on my iPod. 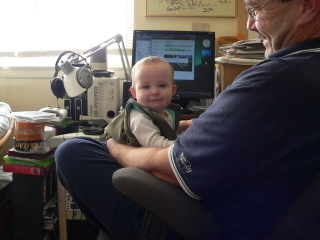 There appear to be lots of programs you can buy to do that but he found that a program he already has will do it, fast and easy. 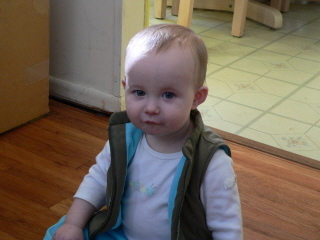 So, now I have all Lorelai's video on the iPod and I can bring it with me to show friends and family how she's grown. It's looks surprisingly good! I don't need movies from iTunes on the iPod. I can't see me watching movies anywhere. I use it basically for the music. I love the iPod itself but the iTunes software is so confusing. It takes me so long to figure things out. They have fairly prompt tech support, though. I've sent them emails and gotten help within a couple of days. Pretty good. Winter seems to have caught up with us. We had some light snow this morning. It really was pretty and it's gone now. That's the best kind of snow! Nope, we're not quite ready for sledding yet! We'll just have to wait and see what the rest of the winter has in store. Pretty darn cool. Is it just me or are those his boxers showing above the pants? I don't know. 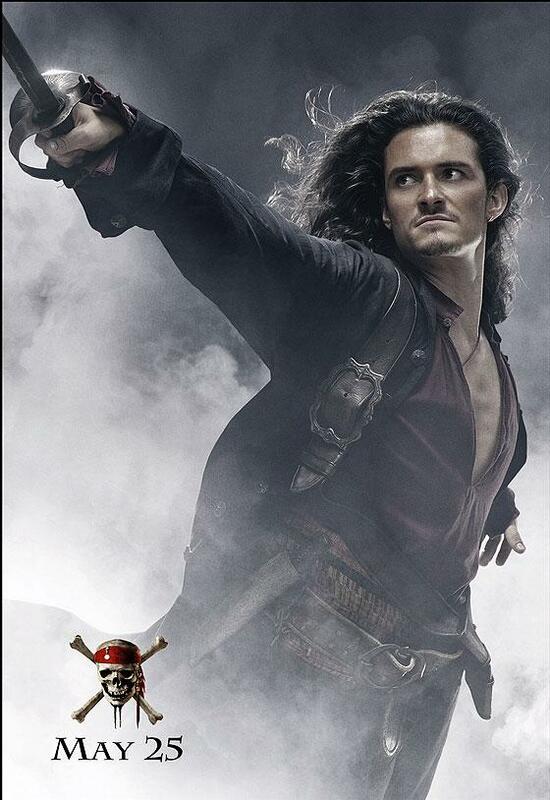 Whatever, I'm going to miss these Pirate movies once this one's released. They're so much fun. It's a dreary day, drizzly and chilly. It's a good day to stay indoors and knit, read or whatever. I've started to work on a couple of sweaters I started along with the socks that have been my addiction recently. 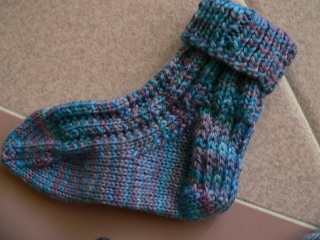 I finally found a sock pattern, however, that should fit Lorelai. 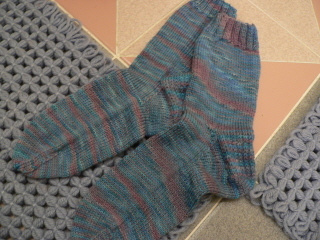 I used leftover yarn from a pair of my socks. This is 100% wool but it's still machine washable and dryable. The first time I washed them, I held my breath when I took them out of the dryer but they're fine. In fact, they're even softer than they were before they were washed. They're so nice. So, they'll be fine for Lorelai. I didn't want to use yarn that had to be hand washed. This will make it easier for Kelly to wash them. Funny how the color looks so different in the two pictures. It is the same yarn. They're cute socks, very stretchy, and they should fit her. A horrid day. Rain, rain, rain. I have been sitting over the fire knitting and reading. Mother sitting opposite with her knitting asked me such endless questions in regard to her stocking that I put down my book impatiently and am trying to write. I feel awfully cross and out of sorts and can't at all understand how so simple an affair as knitting a stocking should appear an insoluble problem. Mother can't conquer the mystery of "turning the heel" - there it is again - "Emma, how many times did you say I must knit plain?". I think I shall put my pen down and run away. I suppose I believed that young girls during that time and earlier would not have shown their impatience but it sounds as if Emma made it quite plain to her mother that she was annoyed by her constant questions. I found it really interesting. 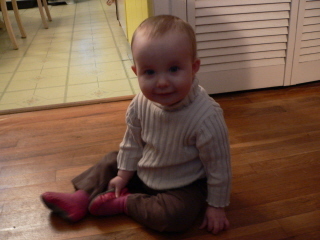 I also wonder who taught Emma to turn a heel if it wasn't her mother, who seems baffled by the "mystery" of it. Hmm. Bill and I met Jan, Eric and Eric's friend and roommate, Andrew, last night to see the play The 25th Annual Putnam County Spelling Bee. Bill and I had seen the show before with Kim and it's a really fun show. We had a great time. Since we're finally experiencing some cold weather, it was nice that the Circle in the Square Theatre is directly across the street from the garage where we usually park. We met on the corner there and decided to eat at a restaurant right next to the theatre so we wouldn't have to walk in the cold! It's called Federico's and the food was excellent. The waiter was trying to impress us by speaking Italian, laying it on thick, but Eric decided he was probably born in Queens and his parents are really Greek. Whatever, the veal scallopine was wonderful! Lorelai's birthday is later this month. It's amazing that she's a year old already. It just doesn't seem possible. She's pulling herself up and trying to take a few steps. 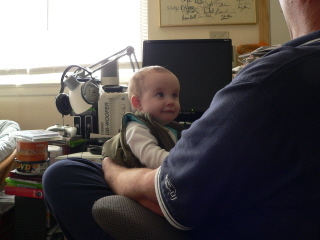 She'll be walking soon and that means Nana will be very tired at the end of our Sundays together. I'll be begging her to take a nap! Back to the dreary day. Ta-ta! It's going to take me awhile to get used to typing 2007. It's January and we've yet to see any of that white stuff. I wonder about the weather. I really can't complain. We're sure saving money on heating costs. It is a little like waiting for the other shoe to drop, though. One of these days, winter is going to hit us full force and we won't be ready! Ever since Christmas, I've been struggling to get over something. 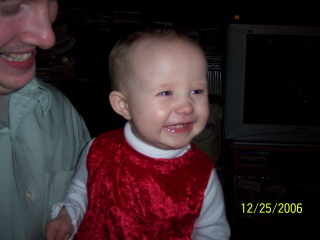 A day after Christmas, I was hit with the stomach virus that's going around. I'll spare you the gory details but I don't remember ever being that sick. It took days to recover any strength. Then, I had trouble with my neck. I have arthritis and occasionally, this will cause me to become dizzy and light-headed. I just wasn't feeling well enough to deal with that. I now have a cold. Usually, I can carry on pretty well with a cold but I just feel so debilitated and worn out. I just haven't had time to start feeling better before something else was bothering me. I'm hoping I'll start feeling better today. It's about time to "dismantle Christmas" and I've got lots to do. Sigh. American Idol is back later this month. Yes! I love the early episodes. The worse they are, the more fun it is to watch. Then, next month, we'll finally find out what's happening on LOST. I almost gave in and started watching Daybreak, the show filling the gap between LOST's two "seasons", but I didn't. Good thing. It looks like since it's been cancelled, fans will be lucky to see the remaining episodes on the web. You'd think since they already filmed them, they'd at least show them rather than showing reruns of something else. Doesn't make sense to me but I don't run the networks. TTFN and happy new year, all!